The DWCA Book Club is taking a trip back in time… to 2003. Russell T Davies’ revived series had only recently been announced, though of course the first episode would not air until March 2005. 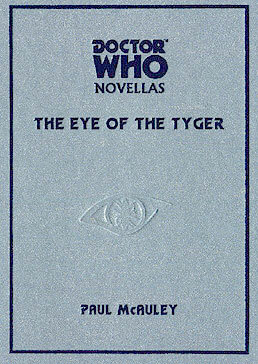 And so the “current” Doctor remained the Eighth, whose adventures at this point had been mainly confined to books – books such as The Eye of the Tyger from Telos Publishing. Inhabiting a colony spaceship in the 32nd century are members of a religious cult that left Earth to find a world of their own. Their leader, Seraph, has downloaded his mind into the ship’s computers, but now he has gone silent, enticed and serenaded by a siren song coming from inside a black hole. Trapped in orbit around the void, Seraph’s followers are confused by his silence, and when the Doctor arrives with his friend Fyne seeking a cure to a raging Tyger-fever which has infected his companion, he finds a world on the brink of chaos. The Eye of the Tyger has been out of print for several years but is currently stocked in very limited quantities at the DWCA Shop, with the deluxe edition of the text now at the special price of $30 (other deluxe Telos novellas also available at the standard price of $60). Signed by author Paul McAuley, illustrator Jim Burns and foreward writer Neil Gaiman (! ), it’s a true collector’s item. The Eye of the Tyger will be discussed at the DWCA Book Club meeting on Friday 7 June. You can also comment on our Facebook page if you can’t make the event. SEND US YOUR REVIEWS AND WIN A PRIZE! Do you consider yourself something of an armchair critic? Send us a written review of the current Book Club text, and your words just may end up published in our club fanzine, Data Extract. What’s more, you will go into the running to win a $5 voucher to spend at the DWCA Shop! Reviews should be sent to fsq@doctorwhoaustralia.org.